Samuel George Phillips had studios in New York City, Philadelphia, and also lived in Atlantic City, New Jersey. Memberships included the Philadelphia Art Club. 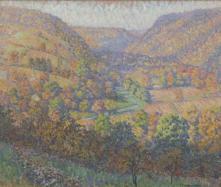 The Pennsylvania Academy was an exhibition venue for the years 1913, 1920-24, 1932 and 1937. He also exhibited work at the Corcoran Gallery and the National Academy of Design.